Herbert Grönemeyer first became known not as a musician, but as an actor for his role as Lieutenant Werner in the 1981 film Das Boot. By that time Grönemeyer had extensive experience in both music and acting, however. He founded his first band at the age of 12, was writing compositions for the theater in Bochum at 18, and became the theater's musical director by the age of 20. Alongside his work as a musician, he played numerous film and theater roles and continued producing musical compositions for theaters in Hamburg, Stuttgart, and Cologne. His first album was as the lead singer of the jazz-rock band Ocean, but solo albums would soon follow. His first widespread success as a musician came with the 1984 album Bochum, the first album for which Grönemeyer wrote all of the songs himself. The song "Männer" made him famous in all of Germany and the album remained at Number 1 for five weeks. The 1988 album Ö produced some of his best-loved songs of all time and made him a superstar. That LP was at Number 1 on the charts for 14 consecutive weeks. The momentum of his success proved unstoppable over the next several years. 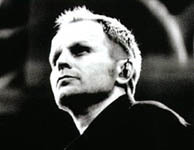 In 1992, 1994, and again in 2003 he was awared the Echo prize for best German artist. In 1994 he became the first non-English-singing musician to play an MTV Unplugged concert. In the late 80s and early 90s, he began to take on some politically explosive themes in his work, including right-wing extremism and issues surrounding German reunification. Due to personal losses suffered late in 1998 -- both his brother Wilhelm and wife Anna both died of cancer within a week of each other -- Grönemeyer postponed the Bleibt alles anders tour originally planned for that year until the following spring. He withdrew thereafter from the public limelight to his home in London until his comeback with the LP Mensch in 2002. Both the album and single rose to Number 1 on the German charts. Grönemeyer described the process of songwriting following such unbearable losses as difficult at best. The result is a more mature, melancholy sort of music than his previous work. From all appearances, fans welcomed the new sound with open arms. The title song on the album became Grönemeyer's first Number 1 single ever. "Mensch " remained at the top of the singles chart for 6 weeks and quickly sold over half a million copies. The album has gone platinum many times over. Though he produced English-language versions of some of his albums for release in Canada, he remains largely unknown in the English-speaking world. At home, however, he is a star. With over 25 platinum records, his signature gravelly voice is well known throughout German-speaking Europe. In 2003, Grönemeyer returned to his roots in the theater. He agreed to create the musical scores for a rewrite of Georg Büchner's sarcastic comedy "Leonce & Lena" into a musical. The scores appeared as an album in 2005. Mensch (2002) | | LISTEN | SINGLE : "Mensch"- Reached #1 on the German single charts. 4-CD box set of Grönemeyer's first four CDs from 1979-1983: Grönemeyer, Zwo, Total egal, & Gemischte Gefühle.  In 1995, Herbert Grönemeyer became the first German singer to ever perform an MTV Unplugged concert.  Before becoming a famous rock star, he was known for his role in Wolfgang Petersens' famous 1981 World War II movie Das Boot.